Plans to plant thousands of oak trees in Europe's biggest man-made forest have been shelved in an effort to save the endangered red squirrel. 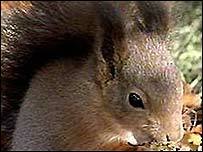 The decision follows a unique computer modelling project, which revealed planting oak trees at Kielder Forest in Northumberland, would be the equivalent of building "motorways" along which grey squirrels would migrate to wipe out England's native red variety. So called "squirrel neutral" trees, like birch and willow, will be planted in vast areas of the 155,000 acre forest in the hope red squirrels will thrive. The vast wood, which stretches from the Scottish borders to County Durham, is home to about 75% of the remaining English population of 12,000 red squirrels. The move follows an 18-month computer study, the first of its kind in the world, which examined 10 years worth of data on squirrel movements and mortality rates. Bill Burlton, environment forester with Kielder Forest District, said: "Spruce trees may not be native to England, but the fact is that reds can find food and survive in conifer forests far better than greys, which out-compete it in oak woods. "Because of this we recognise that Kielder is the last hope of maintaining a viable red squirrel population in England. "Overall, the project has revealed that we are doing the right things in terms of creating a buffer against the greys. "But our oak planting would have been very bad news indeed. We've amended our strategy to plant small seed broadleaf trees instead such as birch and rowan and we'll plant oak in other parts of the district." Peter Lurz, of Newcastle University, said: "The only practical way of stemming the grey tide is to create habitats in which reds can survive and greys cannot out-compete them. 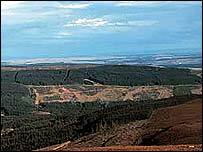 "So that's why this decision to manage vast areas of Kielder in their favour is so important. "It's a very good outcome for all the work done to understand the life cycle of red squirrels and the challenges of developing modelling software capable of mapping their prospects." Since their introduction over 100 years ago from North America, grey squirrels have replaced the native population in most of the country and are taking over Kielder from both north and south. Conservationists say close contact between the two could result in greys passing on the fatal parapox virus to red squirrels. The red squirrel is listed as a priority species for conservation by the UK government.